The Dominant Species is on this weekend! The Dominant Species is an installation of approximately ninety porcelain limpets. Exploiting the translucency of porcelain, the limpets describe a rockpool of light in the suitably maritime venue of the Shetland Museum and Archives' Pier Store. The venue is so maritime, in fact, that the exhibition had to be rescheduled when storm-surges flooded the Pier in December, and again a week later, when gales made it too dangerous to walk out to the Store. 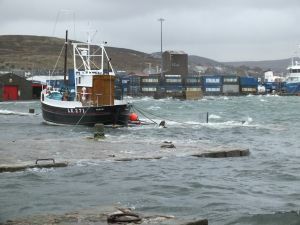 (photo Cathy Hallett and full story at Shetland News). For more than three years, limpets dominated my domestic and creative life. Limpets on the windowsills, the mantelpiece, the shelves. A tub of greening porcelain slip on the kitchen counter, porcelain dust on the handles of the kitchen cupboards. The species was advancing. A fact-finding party from the growing colony had established itself on my windowsill. Surreptitiously, while I was working, I peered over the laptop to see what they were up to. As soon as the sun came out, they began to glow with that lovely, submerged, golden light. 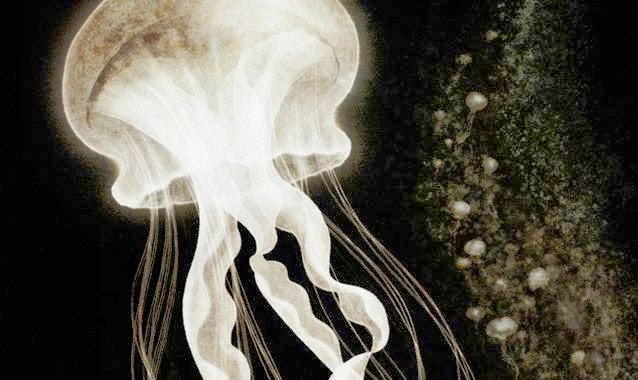 The invasive species seemed to hoard sunlight, glowing – as the poet John Glenday said – as if they hid their light under a bushel. Many limpet-shells found on the beaches and banks are perforated. Whelks will bore into a limpet's stronghold to predate on the soft animal inside. But when I first made a pore in the shell of a porcelain limpet, I made a vestigial face. A pair of limpets angled towards each other were communicating: challenging, agreeing or negotiating. They'd apparently become sentient. My hope for this installation is that visitors' responses will be ambiguous: the limpet-pool potentially peaceful or unsettling. I want to ask whether our ways of making homes for ourselves in the natural world are invasive or symbiotic. Dr Angus Jackson at the Environmental Research Unit at UHI, who recorded the sound New Zealand limpets make when grazing. I'm grateful to him for letting me use it as a soundtrack to The Dominant Species. Big thanks also to Susan Timmins, documenting the show, Roxane Permar, for feedback on the installation, Alasdair Stuart for huge amount of help with firing and to Janice Armstrong, for her introduction to porcelain and for teaching me how to make a thumb pot. And to very many others, for their encouragement and enthusiasm. The Dominant Species will be open at the Shetland Museum and Archives' Pier Store Saturday 16th and Sunday 17th February, from 10.30 – 16.00. First come, first chance at the hot juice!